It hadn’t happened before for a variety of reasons, mostly because the BBWAA’s Hall of Fame voting pool was always filled with a few stuffy morons, but Mariano Rivera became the first unanimous selection to the MLB Hall of Fame. Obviously Edgar Martinez, Roy Halladay, and Mike Mussina are deserving inductees as well, but it’s interesting that the first unanimous entry is a closer. There was a longtime debate about whether relief pitchers deserve enshrinement at all, though pitchers like Lee Smith have been inducted. 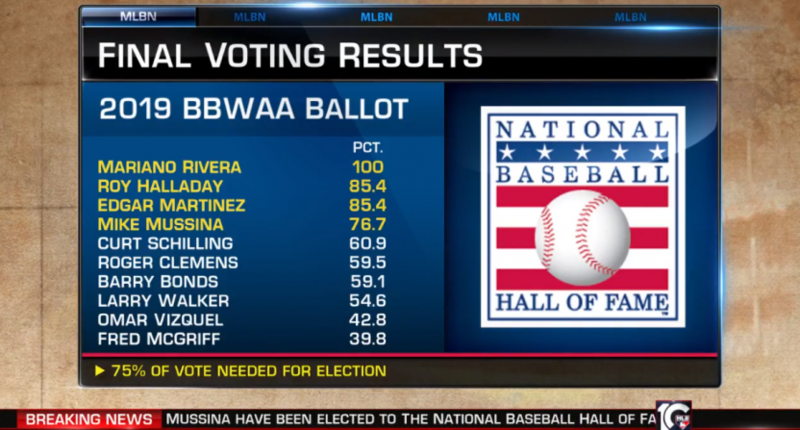 So it’s interesting that when some people felt the need to not vote for Greg Maddux or Ken Griffey Jr. or Hank Aaron, they’d be fine voting for Rivera. That’s not a commentary on Rivera’s career, of course, as much as it is a commentary on how silly it is that no one was unanimous before now. Rivera’s career is clearly worthy of the Hall, and it’s nice to finally have a player (almost) everyone can agree on. My next career move is to be a Unanimous Hall Truther about Mariano Rivera because three ballots weren't returned. CAN'T BE UNANIMOUS IF THREE PEOPLE DIDN'T VOTE. DON'T FORGET TO LIKE AND SUBSCRIBE. That particular talking point was a tired one, and now we can move on. As to the other names, Halladay cleared the 75% hurdle easily on his first ballot, though obviously it’s a moment of mixed emotions, coming about 14 months after Halladay was killed piloting a plane. Martinez, meanwhile, was in his final year on the ballot, and his support swelled from 70.4% to 85.4%, pushing him easily over the threshold. Martinez, like Rivera, faced a positional question; he spent the majority of his career at DH, and there had long been voices questioning whether a career spent mostly taking just a few at-bats every game deserved to be rewarded with a trip to Cooperstown. Like Rivera and closers, though, it’s important to note that it’s a position that’s part of the game. And had Martinez spent the later years of his career at first base, even if he wasn’t good at it, his numbers would still be deserving. Mussina was the only close call on either side of the fence, as he squeaked in with 76.7% of the vote, and that’s also nice to see. Mussina had a long and successful career, including a stretch pitching in some of the biggest spots in the sport, but his type of dominant consistency wasn’t flashy, and he’d only received around 80% of the public ballots revealed so far. But he’s now in, making this a four-man class and perhaps helping end the ballot logjam that has hampered the voting process the last few years. The 2021 ballot includes no decent candidates aside from like…Tim Hudson? That could help PED-tainted names like Barry Bonds and Roger Clemens, along with crazy Facebook meme-tainted names like, well, it’s just Curt Schilling. They all received around 60% of the vote, and could conceivably stand to gain from the lack of obvious names ahead of them. Of course, if you’re not voting for Barry Bonds now, you’re probably not going to vote for him now, either. But stranger things have happened. As for those falling off, Fred McGriff comes up short in his final ballot year, though based on Harold Baines getting in via the Today’s Game committee, McGriff is clearly not out of the running long term. Names falling off after just one appearance include Lance Berkman, Miguel Tejada, and Roy Oswalt. It’s a solid class overall, and it features the breaking of the seal on both DH’s and unanimous inductees. That’s a step in a good direction.